Stephen Colbert now has a fake language named after him. And that's The Word. 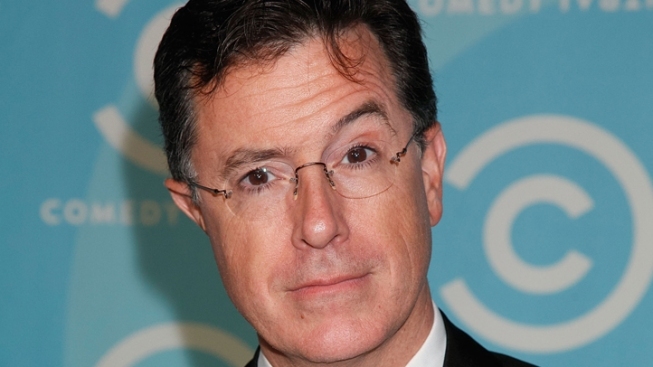 Add a brand new language to the list of things named after satirist Stephen Colbert. Researchers at Northwestern University said the Comedy Central host and prominent Northwestern alum had inspired them to create a made-up language to test whether knowing more than one language helps in acquiring a new tongue. "Stephen Colbert has brought new words like 'truthiness' and 'Lincolnish' into the lexicon," said Communications Professor Viorica Marian in a news release. "We had to invent a new language to do our research, and no one invents words as readily as Stephen Colbert. Naming our new language after Colbert was a no-brainer." For the study, researchers tested 24 participants on 24 words from their made-up language, called “Colbertian,” the Chicago Sun-Times reported. Half the participants were bilingual in Spanish and English. The participants were trained to recognize Colbertian words like “shundoe” for acorn and “glolay” for apple. After they reached a base level of proficiency, participants were asked to match the new words to images of what they represented. The study, which is available online and set to appear in the journal Cognitive Science, found that the bilingual participants experienced “less interference from their native language” than monolinguals when listening to speech in the newly learned language. To test your own skills in Colbertian, click here. The new language is the latest tribute to Colbert, who often enlists his viewers in naming campaigns. According to About.com, that list includes a bridge in Hungary, the hockey mascot Steagle Colbeagle the Eagle, a real eagle, falcon, and a seal. Colbert nearly securing naming rights to a NASA node but settled for a treadmill on the International Space Station named “Combined Operational Load-Bearing External Resistance Treadmill,” or COLBERT. Colbert has also been invoked in academia in disciplines ranging from media studies to theology and philosophy, the Chicago Tribune reported.